I have many containers from which to drink tea. Most of them are mugs, best suited for coffee. Teacups are best for enjoying tea. 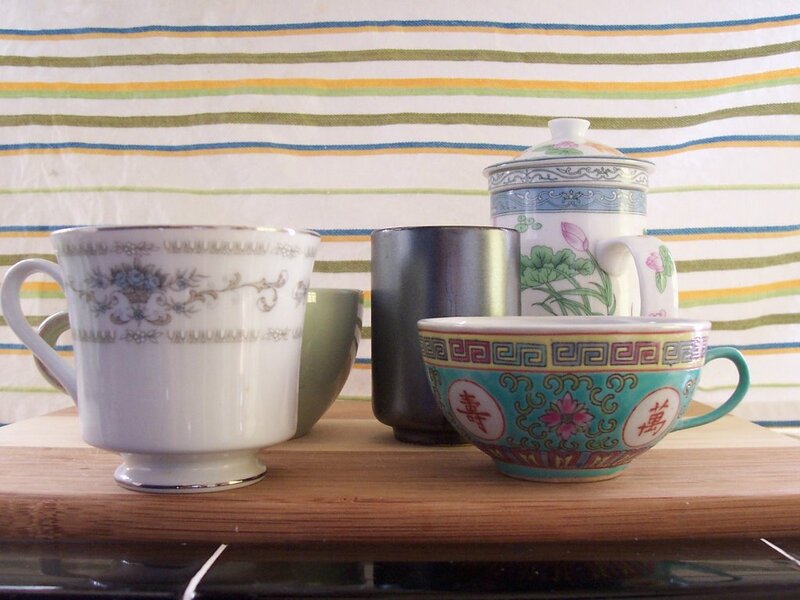 My favorite teacups--all the teacups I own--include a green teapot-cup, a gift from Lin (back left); a Japanese teacup, a wedding gift from Lily (center); a Chinese steeping cup I bought at the Peabody Essex Museum in Salem after viewing the teapot exhibit; a pretty patterned cup, a gift from Lin and Shimona from an East Asian wholesaler in New Haven (front right); and a delicate china cup, from a set my mum gave to me when I moved into my first place. Nice teacups! Do you have a favorite place to buy teacups? I love your site. Thanks for the question. I do not have an answer for you but it will make a great post. Look out for it!